The Great Victorian Swim Series is a not for profit “club” promoting fitness, fun, camaraderie & competition among swimmers and supporters of the Victorian open water swim community. For a small annual registration fee you will receive many benefits while helping to raise funds for Victorian Life Saving Clubs. Join the GVSS club now! 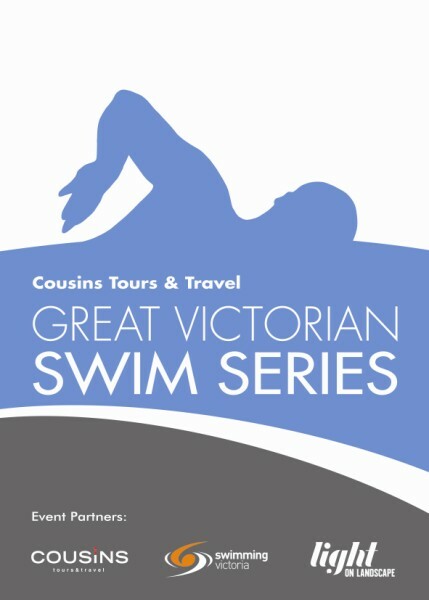 The Great Victorian Swim Series is brought to you by Cousins Tours and Travel and Light on Landscape. We are grateful for the support of Swimming Victoria and Masters Swimming Victoria . Most importantly, the series runs alongside ocean swim events that are all conducted by our hard working and critical Surf Life Saving Clubs and the funds raised from the swims go to keeping our beaches safe. To improve and streamline results Tomato Timing are issuing all series entrants dedicated timing chips/bands that will be used for all events in the series. Your results for the individual swims will be tallied as well as results for the series. This means that series results will ONLY be allocated for people entered in the series. You will be able to identify your competition on the start line and the series results will be much tighter!.........Your job is to cherish and take care of this timing device and wear it at each series event . We have faith in you!......keep your band/chip with your series swim gear. This season Tomato Timing are issuing disposable series bands- at the end of the season you do not need to return it. Only enter Non-Wetsuit category if you intend to swim ALL events in that category without a wetsuit. 18/19 series bathers must be worn in non-wetsuit category. Non-Wetsuit swimmers will automatically be awarded points in the main "wetsuit" category. Please note if a wetsuit is worn in any event you will be disqualified from the Non Wetsuit category. * The WOW Challenge also has a public entry 5km and Kids 750m. The 1.2km and 2.5km WOW events are part of the Series. The Victorian Open Water Championships is held at Williamstown Beach in conjunction with the WOW Challenge, and all entrants into the Victorian Open Water Championship 5km and 10km events must be Swimming Victoria or Masters Swimming Victoria members. Our fun end of season presentation Party (details TBC). Invitation is complimentary for series entrants (includes food, awards,entertainment- drinks at bar prices). You are welcome to bring along friends or family at $35 pp. Dont forget you need to be at presentation to be eliible to win swim trip to Europe! Once you have entered the series you must enter each individual event. For safety reasons many swims cap the numbers- make sure to enter early to avoid disappointment. Swimmers entered in the Non Wetsuit category must wear the series bathers. The "Great Victorian Swim Series" is an ocean swim series for the thousands of recreational swimmers who take part in individual swims over summer. The aim of the series is to encourage more people to be active and take part in these great community events that help raise money for our surf life saving clubs. Entry to the series is simple and you get some great gear and the chance to win heaps more, even if you're not a fast swimmer who is vying for a series win. There are lots of spot prizes as well, including a swim trip to Europe 2019. You must be present at the presentation party to qualify for the travel prizes. A long sleeve series hoodie. Complimentary invitation to end of season presentation party. Series results updated after each race. Eligibility for series placings and great prizes for 1st, 2nd and 3rd in each category. Competitors need to register for the series by 31 December 2018 Enter early to guarantee series hoodie and option to purchase series bathers for an amazing $25. There is no requirement to complete a minimum number of events, you don't have to do any races to win the travel prizes! It is the responsibility of individuals to enter participating races in the series in addition to the series itself. The top 19 competitors in each category will receive placing points and each competitor after 19th place will receive 1 point for participation (excludes DNS and DNF results). The scoring system for the series gives everyone a chance to finish amongst the top places. The swim series is divided into the following seven categories for both Male and Female. Age at 16 December 2018. If you are a member of a masters swimming club select your club when registering. Your series points will be allocated to help your club become MSV open water club champions. Each race in the Swim Series earns you points into the overall score for the series. You are only competing against people in your own category. To be eligible for category and spot prizes, competitors must register for the series before 31 December 2018. For example 1st = 20pts, 2nd = 19pts, 3rd = 18pts, 4th = 17pts, 5th = 16pts ...down to 1 pt. All competitors receive a minimum of 1 point for each event for participation. The series is open to swimmers, supporters and the very important towel and bag holders. You automatically qualify for series points once you have registered for the series. Everyone registering for the series is eligible for spot prizes - not compulsory to compete in the swims. To win one of the travel prizes you must be at the Presentation party draw. You will only be awarded points in the category you have entered. i.e Short Course, Long Course, non-wetsuit. You can enter more than one category. Terms and Conditions of point scoring are subject to change. To be eligible for the prizes in the Swim Series you need to register before 06 January 2019. Congratulations and thanks to all of you that support the clubs and swims - together with Swimming Victoria & Masters Swimming Victoria, Catfish and all participating surf clubs we hope you all have a great swim season! Travel Prize - everyone registered for the series is entered into the draw (you need to be at presentation party to win a travel prize) . Swim trip to Europe 2019 donated by Cousins Tours & Travel. Prizes for first 3 in each category. Plenty of generous spot prizes donated by our sponsors. Spot prize to be drawn at each participating swim (you must be present at the event to be eligible for this prize). If you or your company would like to be part of the swim series as a sponsor we would love to hear from you. Help us make the swim series bigger and better for 2018/19 - click here to contact us.